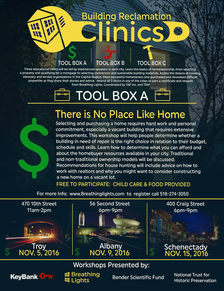 The first in a series of free building reclamation clinics organized in conjunction with the Breathing Lights public art project has events in Troy, Albany, and Schenectady coming up over the next few weeks. Selecting and purchasing a home requires hard work and personal commitment, especially a vacant building that requires extensive improvements. This workshop will help people determine whether a building in need of repair is the right choice in relation their budget, schedule and skills. Learn how to determine what you can afford and about the homebuyer resources available in your city. Traditional and non-traditional ownership models will be discussed. Recommendations for house hunting will include advice on how to work with realtors and why you want to consider constructing a new home on a vacant lot. The clinics are free to participate, and there will be child care and food provided there. The events are coordinated by TAP and TRIP. The next groups of clinics are set for January and February.